The Lar­gest Fly­ing Adver­ti­sing Mes­sa­ge in the World: With our Sikorsky S76 heli­cop­ters, we can fly sky ban­ners up to a cur­rent maxi­mum size of 5500 m²! Heli­Jet Char­ter GmbH thus offers a top‐class aeri­al adver­ti­sing medi­um with a uni­que sel­ling point unbea­ten the world over. The emo­tio­nal effect of such a gigan­tic ban­ner achie­ves the hig­hest chan­ce of per­cep­ti­on and con­tact for this adver­ti­sing medi­um and with it you too will be able to demons­tra­te SIZE and make a las­ting impres­si­on on your tar­get group in the form of this extre­me­ly effec­tive form of com­mu­ni­ca­ti­on. We will attend to every step in making your adver­ti­sing pre­sence effec­tive. From the pro­duc­tion of the ban­ner to the pre­sen­ta­ti­on in the air, all ser­vices are from a sin­gle source. We would be plea­sed to dis­cuss it with you with no obli­ga­ti­on. 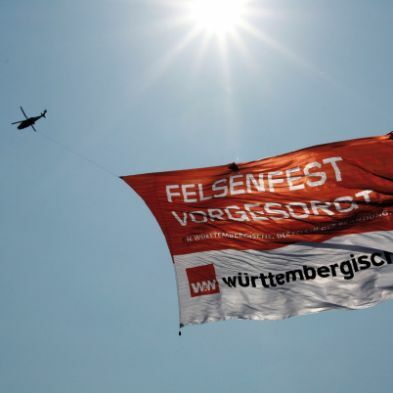 Heli­Jet in Dort­mund holds the world record for the lar­gest fly­ing adver­ti­sing area. In 2011 a Sikorsky heli­cop­ter belon­ging to the com­pa­ny towed a 5000 m² ban­ner (near­ly the size of a foot­ball field) through the ski­es. A 2000 m² ban­ner can easi­ly still be read from two kilo­me­tres away.